Hurricane Sandy went through Royal Caribbean's private island of CocoCay and despite some damage, the oasis for Royal Caribbean cruise passengers is open again. Royal Caribbean spokesperson Cynthia Martinez talked about the damage the storm did to the island, "The island of Coco Cay was impacted by the storm, with damage being sustained to some of our facilities and the beach areas. Our Coco Cay team has been working diligently to prepare the island for our guests arrival." Despite the damage, Majesty of the Seas called on CocoCay yesterday as scheduled and Monarch of the Seas is expected to also call on CocoCay today. Bahamas Ministry Of Tourism director of cruise development, Carla Stuart, claims that Hurricane Sandy had cost Nassau alone a collective $927,000 in lost cruise spend and taxes. Ms Stuart noted that vessel cancelations between Thursday to Saturday last week cost Nassau an estimated $742,000 in passenger spending, plus $185,000 in likely departure tax. Royal Caribbean is starting to take a look at the damage Hurricane Sandy has done to its private island of CocoCay in the Bahamas. "The impact to the island of CocoCay from Hurricane Sandy was not severe, but requires a significant cleanup effort ahead of guest arrival. 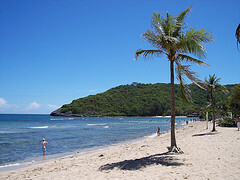 Guests will be able to enjoy most of the island, however due to significant beach erosion in one area of the island, that area will unfortunately not be accessible to guests. The majority of our shore excursions will be available." The good news is the Bahamas Ministry of Tourism says things are nearly back to normal in Nassau and Freeport, where minimal damage was sustained. 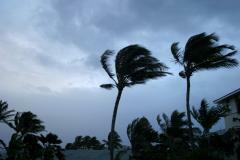 Royal Caribbean is announcing two more of its ships are being affected by Tropical Storm Isaac. Both Majesty of the Seas and Monarch of the Seas will not stop at Royal Caribbean's private island of CoCo Cay this weekend due to concerns of the storm. This change is in addition to the previous announcement that Allure of the Seas will change from an eastern Caribbean itinerary to a western Caribbean itinerary. As of 11 a.m. ET, Isaac was 165 miles south-southwest of Santo Domingo, Dominican Republic and moving to the west-northwest at 14 miles per hour. The storm has maximum sustained winds of 60 miles per hour. Recently there was a dispute between the local vendors on Royal Caribbean's private island of CocoCay and the cruise line after Royal Caribbean announced plans to open a store on the island that would sell Royal Caribbean goods. It now seems the locals are okay with the plan after the store opened and the only merchandise being sold is branded Royal Caribbean gifts. Our friends at Cruise Radio submitted this on-location report confirming that the locals have come to terms with Royal Caribbean's decision. Vendors on the Berry Islands of the Bahamas are upset with Royal Caribbean over a newly opened signature store on its private island of CocoCay. These vendors claim the new store has cost their revenues to be slashed by 75%. Mary Neely-Knowles, a spokeswoman for the Coco Cay vendors, claims the vendors cannot compete with Royal Caribbean's store despire the store being open for only two weeks. 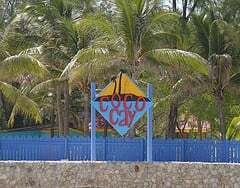 “We are selling T-shirts with the Coco Cay logo on it and they are selling T-shirts with the Coco Cay logo on it and Royal Caribbean . . . their t-shirts are $10, ours is $18." “And we can’t sell any lower [because] most of our T-shirts come from the States or Nassau [where] they start from $7 to $8, so you have to sell $15. Neely-Knowles went on to claim that workers have noticed a shift in the purchases passengers have been making. In addition, Royal Caribbean's cashless system of purchases has further created problems for the vendors as many passengers are now disembarking without cash. A letter obtained by the Guardian Business shows Royal Caribbean received approval from the Bahamian Director of Investments, Gaydene McClain for the store under the condition the items sold in the store would “have Royal Caribbean’s logo” on it. The vendors believe that the distinction wasn't enough and that their items overwhelm the vendors with similar goods. The fact of the matter is governments in the Caribbean enter into these agreements with cruise lines as a way of constructing state-of-the-art cruise facilities, which in turn guarantees long-term cruise traffic. Officials from the Bahamas government assert it would very difficult for the Bahamas to maintain or grow its share of the cruise industry without such competitive incentives. Hurricane Irene caused enough damage to Royal Caribbean's private island of CocoCay in the Bahamas that Royal Caribbean officials had to cancel three stops over the weekend to the island. The damage has been repaired and CocoCay is open for business once again. Royal Caribbean has been forced to cancel stops to its private island in the Bahamas, CocoCay, through Monday due to the effect Hurricane Irene had on it. Royal Caribbean's reasoning for cancelling is being described as, "we feel our guest's experience ashore would be disrupted". Monarch of the Seas will now stay overnight in Nassau, Bahamas, arriving at 12:00 p.m. today and departing at 11:00 a.m. on Sunday, August 28. No word at this time if any further cancelations will be necessary. Royal Caribbean reported sending a team yesterday to evaluate the damage to the island. A guest posted a brochure from a new cabana program that is set to launch on Royal Caribbean's private island of CocoCay that would be similar to the cabanas that are available on Labadee. It appears that like Labadee, these cabana options are available first to guests staying in a suite aboard their ship and any excess inventory is then offered to members of Royal Caribbean's Crown and Anchor society based on their seniority in the program. This cool time lapse video shows lots of cruises and features many Royal Caribbean ships such as Jewel of the Seas, Splendour of the Seas & Majesty of the Seas and the Royal Caribbean private island of CocoCay. The Orlando Sentinel has posted a review of the private islands that cruise lines have been using to lure customers on their cruises for years. These paradises are great for the beach lover and offer the benefits of a day of sun, sea, beach and more. Included in these reviews are the two islands that Royal Caribbean offers to its cruisers. This 138-acre island (Little Stirrup Cay in the Bahamas' Berry Islands) offers a private island experience to Royal Caribbean International's passengers. 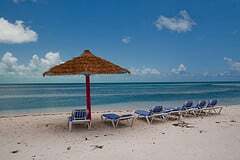 It has beautiful beaches, food and drinks, organized pastimes including limbo contests, volleyball tournaments, and children's activities.A variety of water sports is available, including snorkeling--snorkelers can see a replica of a pirate galleon. When you just want to relax, one of the hammocks may be the ticket. Located on a 267-acre peninsula in Haiti's north coast this is another of Royal Caribbean's enclaves. In addition to the pleasures of the sea and sun, Labadee offers cultural pastimes including a folkloric show, tropical bands and artisans' market.Families with children will appreciate a water park, Arawak Cay, featuring water seesaws, slides and more.